I encountered a really useful tool – or set of tools – for D3 that has really changed the approachability and ease of use of the library for me. Adam Pearce who works at the NYTimes Graphics team recently gave a talk on writing reusable D3 code. 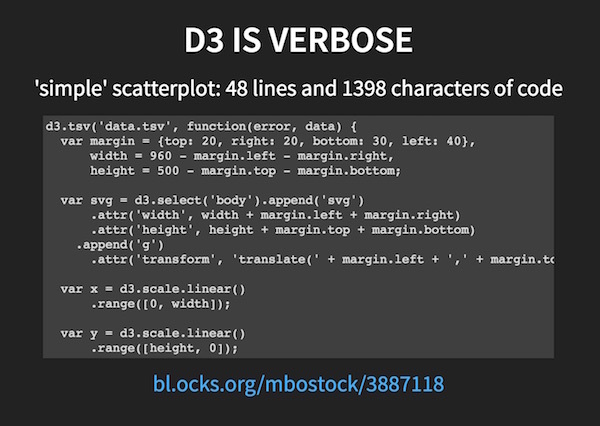 His premise was that D3 is incredibly powerful but at times cumbersome and verbose. 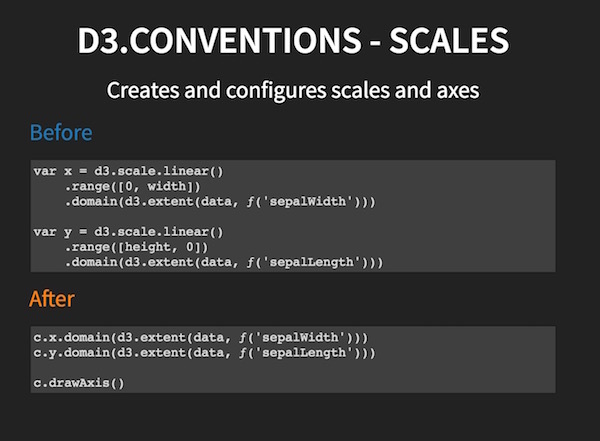 As a heavy D3 user, he grew frustrated with the amount of repetitive code he had to write to accomplish even simple functions. Adam’s work is inspiring not just because it makes D3 a lot more user friendly and accessible to me (hopefully will reduce coding time) but also because he has inspired me to write my own function wrappers to APIs and libraries I find cumbersome. I’m going to rewrite a few of the map graphics I’ve been working on with these tools over the next week. This entry was posted in Looking-Outwards on 11 May 2016 by Irene Alvarado.